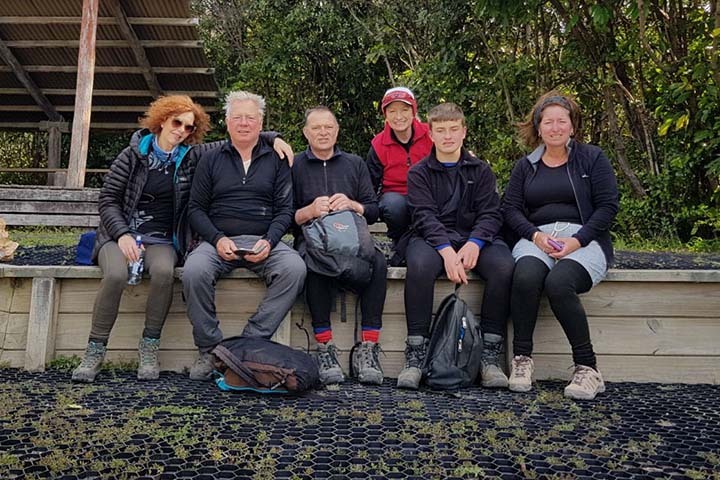 It’s been on my bucket list for some time – the Tongariro Alpine Crossing experience, one of New Zealand’s greatest and most beautiful natural scenic hikes through a world heritage site is something every tourist must do. As a Kiwi, I was somewhat embarrassed I still hadn’t done it…the voice in my head had started to tick me off me for my pathetic list of excuses. So, when my mate Paul was getting a posse together and planning to stay nearby at The Park Hotel in National Park in November, I was first to add myself to the list. After promoting the event on Facebook, we gathered a bunch of 12 all up. Clearly, with ages ranging from 14 to 70, we were a group of mixed ability. To my relief, this was not going to be a roughing-it type getaway. 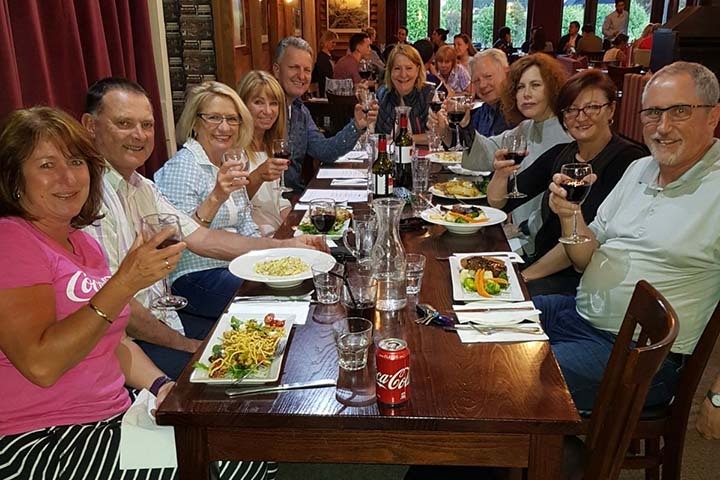 As sophisticated Metro dwellers, we wanted to make sure it was more of a seamlessly successful adventure with the reassuring luxury of crisp white sheets, good service, excellent wine, hearty food and a relaxing hot spa at the end of our trek thrown in. Paul booked The Park at National Park, because I could personally vouch for it having stayed there before. The Park was recently bought by my friends Kathy and Mark who have made sure it provides excellent service, warm comfortable rooms and great food. It is also only a few kilometres up the road from the starting point at Mangatepopo Carpark. On the eastern side of the crossing they advise you to start the climb here, as it is at a higher altitude from the Ketetahi end and therefore requires less climbing. It also is the path of more gradual exertion. The other side goes straight up – for hours! Kathy is familiar with the volatile mountain weather. She put Paul in touch with Adrift Guided Outdoor Adventures who would organise and provide transport to and from the mountain and keep us safe. The guides were a lifesaver, literally. The morning after the day we arrived dawned beautiful clear blue skies. Except for the fast-moving fluffy stuff around the mountain tops. And that, said our guide Laura when she arrived in the wagon to collect us, was alarm bells to those in the know. Pretty as a picture but dangerous as hell. Those clouds signalled winds gusting up to 70kph which could very well put the whole journey in jeopardy. After a huge breakfast, scrambled eggs, mushrooms on toast, bacon, pains aux chocolats – well, the more carbs the better – we loaded up a healthy and delicious packed lunch provided by The Park. Then we drove over to Adrift for our briefing and to check our gear list. Each of us stood in line waiting for Dr Gerhard, and Laura went through every item we were wearing and taking with us up the slopes to make sure we had the appropriate equipment required for freezing alpine conditions. Here’s me in my shorts, worrying about makeup! Those without the right gear could hire it. That’s the thing – because we were with Adrift we didn’t need to worry. They took some of us back to the hotel so we could replenish our packs with gear we thought we hadn’t needed. It was good to be assured we had the right stuff. 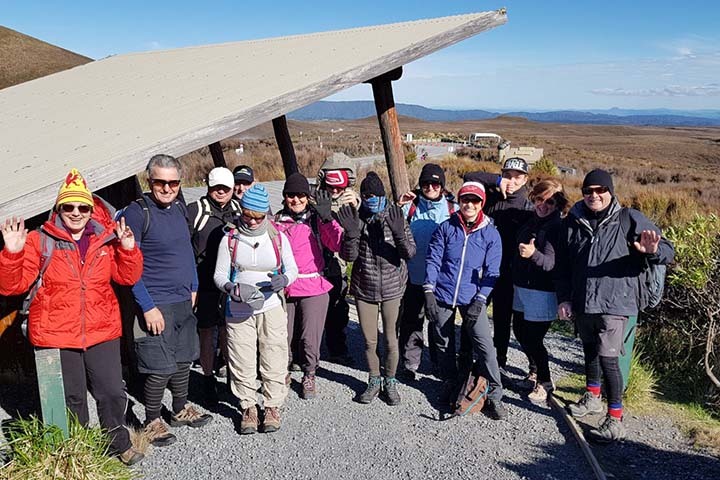 The Tongariro Alpine Crossing experience begins! Then we were off. As I stepped from the van into the carpark, a fierce wind stung my face and ears. This was cold like nothing I had experienced before. On with the funny woolly hat I’d borrowed. On with the face scarf. On with the built-in hoodie. Gloves on. It was a bit of shock and I was thankful for the pep talk at base which had seen me ditch the shorts. Laura set the pace in a gentle trek across the gently rising plains, stopping periodically to point out things of interest. Don’t drink the water from that pristine stream charging over the boulders behind it. It contains a mix of heavy metals including arsenic that could seriously dampen your fun. The first upward zig zag took us to Soda Springs and a loo stop. At that point we had a group meeting to assess whether the slower ones in the group should go on. The wind was so brutal, simply standing was difficult, let alone bracing against it as we walked. One of our group had started suffering from arrhythmia – an erratic heartbeat. He decided to turn around. Another had fallen on a previous mountain climb in Nepal and with a metal plate in her leg, she found it too tough. Still another realised her fitness level wasn’t up to it. Going without the guides is OK for those who know the mountain well and are going up as a small group. But for a larger group, the experienced guides are invaluable. They were constantly in touch with base, checking the weather and finding out what we could expect all along the track. In fact, at one stage plan A was to turn around once we’d got so far as the winds were too dangerous. On reflection, my overriding feeling throughout this whole adventure was of ease and safety. The relief of not having to think about getting from A to B, packed lunches as part of the package, and knowing we were being totally looked after, throughout the whole journey was well worth the price of guides. Not having to think is certainly a good thing. That went for Paul as well. It’s fine having guides suggest some of the party turn back. Not so when it’s one of us. Onward we went up the Devil’s Staircase to the massive level moonscape of the South Crater where a couple of girls were hidden in foil wrap battling hypothermia. Laura chatted to them to ensure they were hydrated as we waited for the helicopter to arrive before ascending again to the Red Crater. This deep red chasm had exploded into life in the early 1900s. Fortunately at this point, the wind dropped sufficiently for us to continue and we kept climbing. At the highest point, we stepped onto a promontory to look down on a magnificent sweeping landscape punctuated by the incredibly, almost unreal emerald lakes – breathtaking! Trudging down towards the blue lake on a narrow sandy strip, once again the wind tossed us bodily. We had to link hands to keep on our feet, before stopping just 15 minutes to eat our lunch, lest the cold become so intense risking hypothermia. The track then took us past the active Te Maari Crater, steaming away reminding us this mountain chain is very much alive. The most recent eruption was only in 2012 and Laura pointed out the yellow-hued boulders that it had spewed forth, splattered across a vast terrain. Again reminding walkers of the imminent dangers that lurk, the DOC hut at Ketehapi Shelter where we stopped for a wind-free snack and breather further down the path, had suffered in this very eruption. Boulders had shattered the roof and hurtled straight through the floorboards. Once again, Laura gathered our group to advise it was at least 1.5 hours downhill from here – that she and the other guide we’d picked up along the route would be there to sweep up the slow coaches and we could head out at our own pace. Six of us were hell-bent on reaching our final destination. We charged ahead through endless tussock which eventually gave way to native bush. It went on and on downhill until my toes were creeping through my socks into the leather of my boots. Every corner, I regarded with desperation. When at last we saw the hut at the end, it was indeed with a sigh of relief. And the sight of Dr Gerhard with cold beers rates as a finer moment of the trek. Paul had his hip flask of whisky. That certainly went down a treat as we lay on the grass in the sun, stinking toes pointed to the sky. The wind had disappeared. The day was still – bliss in the early summer evening. Around 7.5 hours later, back at The Park, we all jumped in the hot spa and regaled each other with the worst and best of the day. Dinner followed quickly and my hot curry with chutney and raita was a highlight – as was the sparkling wine that splashed down my dry throat a little bit too easily. And so to bed, early I have to say. One of my better sleeps in a deliciously comfortable bed. 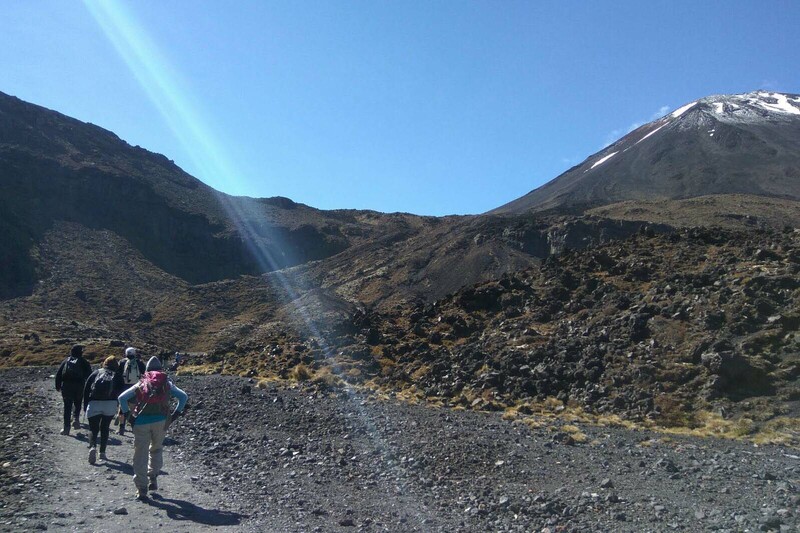 Here is my summary of the Tongariro Alpine Crossing experience. No hassles, hiccups or pain. Thanks Kathy and The Park. Thanks Laura and Dr Gerhard. Thank you to Vicki Holden for sending us this post.